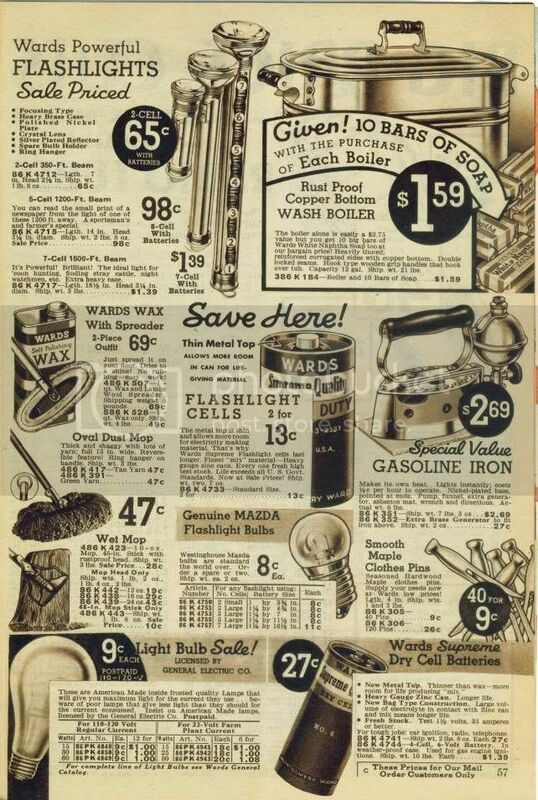 If only we had these prices with todays pay..check out the GAS powered iron .....yikes! Can't (still) post my own pics but have a brick all embroidered and sewn into it is 1800! Common for door stops. 1802 - Sarah Judkins my actual Grandmother X 3 was born and have a picture of her Very early as she died in 1866 - yikes! Why worry? Oh me oh my the asbestos we dealt with. I do recall the pads for irons, pipe insulation, roofing and siding for buildings and still have some old homes with the dang stuff still holding up never mind the automotive brakes (drum) that I/we used to blow out to clean up. As a kid painted a farm house, barn and silo with "Scott Laddy" - the most leaded paint known that the can was heavy! Truth is the damn lead worked to kill off mold, repel insects of all kinds and did preserve the wood. Should show a newer version of one right in front of me now - Ambassador Old Scotch Whisky. I have to just type what the back label says "The contents of this bottle constitute only Pure Scotch Whisky of great age and superior quality. "Under the Guarantee of the Blenders and Proprietors." Both were (have two) still full and corked and tasted one with others and stupid me have stored the other upright and the cork fell inside and would have been intact another 100 years if stored on side with cork wet.